These cookies have a pretty generous amount of chocolate chunks in them. I made half the original recipe (18 cookies) and used about 1 1/2 cups (or 9 oz.) of chocolate chunks in total. I went with roughly 3 oz. of white chocolate (it happened to be the amount I had on hand), with chopped semisweet for the rest. Just FYI, Ina's recipe would call for an even more generous 2 cups of white chocolate chunks; while I think this cookie could handle it, I was a bit more reserved. Mix the proportion of chocolates or add some nuts to customize the cookies to your own liking. The original recipe calls for "exactly" 15 minutes of bake time but I suggest keeping an eye out on them and baking until they are just set (no longer look wet) but still moist. I pulled mine out around the 12 minute mark. You'll be rewarded with cookies ready for snacking, or ready to be filled with ice cream for ice cream sandwiches. Either way, you've got a great treat. And now, here we go into Labor Day weekend! I hope you and your family have a great one!! Cream butter and sugars together in a stand mixer fitted with the paddle attachment until light and fluffy. Add vanilla and egg, mixing until combined, scraping the bowl as needed. Add cocoa powder and mix until just incorporated. In a medium bowl, whisk the flour, baking soda, and salt together. With the mixer on low, gradually add the dry ingredients to the batter, until just combined. Fold in the chocolate chunks using a rubber spatula. Cover cookie dough and chill for at least an hour, or overnight (this is not absolutely necessary but I find it easier to work with a firmer dough). Preheat oven to 350 degrees. Line baking sheets with parchment paper or silicon baking mats. Drop cookie dough onto the baking sheet using a 1 1/2 tablespoon ice cream scoop, spacing them about 2 inches apart. Dampen your fingers and flatten the cookie mounds slightly. Bake until cookies are just set but still moist (no longer look wet but it's okay if they seem slightly underdone), about 12-15 minutes. Remove pans from the oven, let cool slightly, then transfer to a wire rack to cool completely. Enjoy the cookies warm, at room temperature, or filled with ice cream for ice cream sandwiches! Oh, pics of your trips in Europe make me wish I was there! They are seriously dreamy! I definitely need some of these cookies to console me..I don't want summer to end! Whipping up a batch of these bad boys soon! Welcome back dear. I missed your recipes. I want these cookies right now :-) Looks so perfect and delicious! How sweet of you! It always feels like home when you take a batch of cookies out of the oven. I love cookies like this! Great recipe for the end of summer. Welcome home, Monica! Hope you guys had fun on your trip - a cruise sounds like so much fun! :) These yummy cookies are the perfect treat to indulge in before school starts. Can't believe how quickly this summer flew by! Glad to know that you had a great summer vacation! 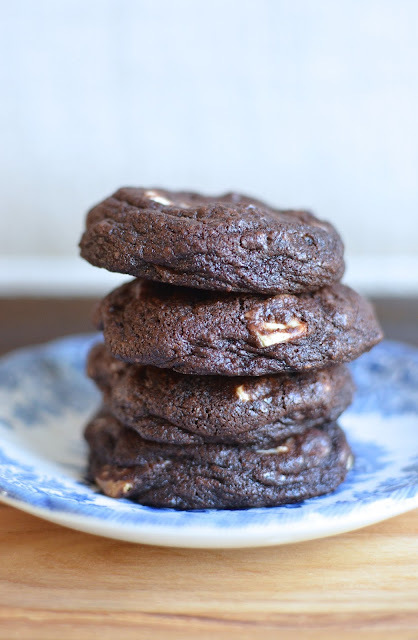 These cookies look wonderful with lots of chocolate! Omg these are heaven !! Who doesn't like chocolate cookies and then using them for ice cream sandwiches ? What could be better ! Glad you had a wonderful time on your cruise, there's nothing like family time! Have a great weekend !! Whoa, that looks like an epic dessert of chocolate cookie and ice cream. Nice to know you had great summer vacation. I love cruises. Where did you guys go? Hi Balvinder! We went to Bermuda on board Royal Caribbean. We have now officially satisfied our curiosity about cruising. : ) I think the little one is ready to go back anytime. It really was quite relaxing. Cruising is very relaxing and fun!Glad you all enjoyed. Yes, don't they look so dark and decadent! All those chocolate chips always call out to me! : ) Have a great weekend as well. A crusie sounds like a wonderful way to create special family memories. Love these cookies Monica, glad you are back. Thanks so much, Cheri. Where did this summer go. I knew it would be this way so at least I was mentally prepared...but still, I don't want to let go!! Lovely that you had a nice summer vacation. I love chocolate cookies with chocolate chunks. These cookies are making me drool, specially the one with the melting white chocolate. I am sure my family would love this. Thanks fro lovely share. Wow! Bermuda! It sounds so amazing that there are people who can actually get to Bermuda so easily, for me, so far away, sounds like an impossible dream... :) I love the cookies and especially the idea of serving them with ice cream, that would make my kids particularly happy. Goodness, these look amazing - especially the ones with the ice cream in the middle! Yes, they were calling out to be made into ice cream sandwiches. White chocolate for the WIN!! They are a nice contrast against the dark chocolate cookies...thanks! OMG Monica how thick and chewy these are!! I am so craving these now with my tea. And the one with ice cream , girl please be my neighbor so I can come over and eat all of these!! Yum!! Have a relaxing weekend! I'm glad the trip inspired me to try this recipe. It was a tasty one. Thank you! I have never been on a cruise, but appreciate that they can be a relaxing get-away and a hassel-reduced form of travel. I am intrigued by the smaller boats that do river cruises in Europe. Maybe some day. :) The important thing, is making happy family memories and it sounds like that is just what you did! Any vacation filled with cookies like these sounds like a good one to me. :) I love the combination of dark and white chocolate. My husband and I have also seen shows with those river cruises in Europe and we're curious, too. Maybe some day... : ) The trip was fun and I'm happy to finally try it; the little guy has asked for a while! I am always annoyed that Ina’s recipes call for XL eggs since I never have them on hand.